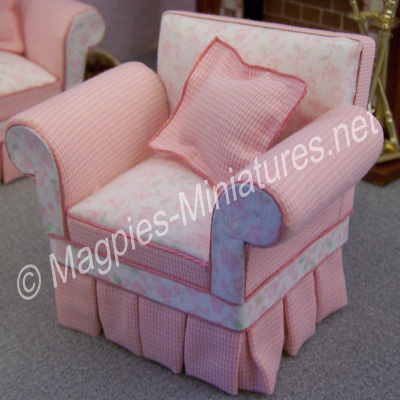 This is our newest "shabby chic" style chair with a square back, rounded arms and softly pleated skirt. 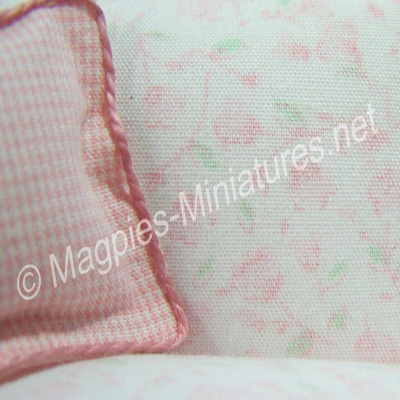 We've coordinated a pink floral fabric with a micro pink check fabric. The floral fabric has been used on the arm fronts, the seat cushion, seat back and the trim around the skirt. The chair comes with matching pillow and both the chair and pillow are beautifully finished in a coordinating mauve trim. The feet are wood. A matching sofa is available. Pillow: Length: 1-3/8", Width: 1-1/4", Thickness: 1/2"